For many beginners, graduating from learning how to throw a disc back and forth to taking those skills into gameplay can be an intimidating experience. Not used to facing a mark whose job is to prevent the easy throw, they look like a deer caught in headlights, frantically searching for the closest teammate to dump the disc to. They need to find a way to appear more confident with the disc and create space for themselves as a thrower so they can complete the next throw. Even more advanced throwers, looking to threaten more of the field when the disc is in their hands, face similar challenges to taking their game to the next level. Challenging a mark to push the disc to the break side requires the ability to move your defender away from the space you hope to attack. In either case, faking is an important tool to accomplish these goals. But it has to be done believably in order to be effective. Many newer players get into a bad habit of never throwing any fakes or, even worse, faking constantly for no particular reason. Many advanced players can still do a better job of translating their successful fakes into open opportunities for a break throw. No matter what level you’re at, take the same approach to improvement by learning to fake with precision and intent. The good news is, the elements of a good fake are also the elements of a good throw! By practicing believable, comfortable fakes, you can help develop the weak points in your throwing repertoire. Focus on developing the form of believable fakes by honing in on your grip, upper-body throwing motion, and pivot step. Effective fakes require a tight, comfortable grip on the disc. A loose grip limits your control on the disc, making it difficult for you to fake sharply and decisively. In a worst-case scenario, a hard fake with a loose grip can cause you to lose control entirely and drop the disc. Trust me, I know from experience. Strengthen your grip with exercises like rock climbing, where you really focus on the dexterity of your fingers. To make your fakes count, it’s also important to be able to quickly switch your grip. The half-second you save by efficiently transitioning from a forehand to a backhand grip and vice versa can determine whether you’re able to capitalize on the open space your fakes create. You can practice this switch anytime using a series of mini-fakes, both while at the field and even while sitting at home; just gently flip the disc between the two grips. Be conscious of how your grip on the disc is changing as you do so. When switching from a forehand to a backhand, use the pressure of your fingers on the inside of the disc’s rim to flick the disc just like you would when throwing a forehand. Instead of releasing the disc completely, just lightly loosen your grip with your thumb as your fingers push the disc into your open palm. Curl your fingers under and tighten your grip; now you’re ready to throw a backhand! When switching from backhand to forehand, you’ll again loosen your thumb’s grip on the top of the disc. Uncurl your fingers on the underside of the disc and, as the disc rotates around, catch the disc on your index and middle finger. Tighten your thumb’s grip on the outside of the disc into a forehand grip. This is a fairly difficult skill to master when you’re first learning to throw, so it’s absolutely fine to use your off hand to help you switch and secure grips. Just think of that off hand as a training wheel; it’ll help you learn correct form and succeed in the short-term but, when you’re ready, you should challenge yourself to perform without it. Once you’ve got a nice, tight grip on the disc, remember the number one rule of a good fake: Fake like you throw. If your opponents can easily distinguish between your faking motion and your throwing motion, you’ll have a hard time getting your mark to bite. Break your throwing motion down into elemental parts and practice each separately and together so you get comfortable extending all the way through your throwing motion while maintaining a tight grip on the disc throughout. The first piece of a throwing motion is simply setting up your body – specifically your core and shoulder – in a position that allows you to move your arm through a throw. Replicating the shoulder movement that you perform at the start of a throw is a great quick fake option. In fact, sometimes a simple dip or “shimmy” of your shoulder may be all you need to get a defender to bite on a fake. As you then swing your arm forward, make sure you are moving it along a realistic throwing arc. Faking too much up in the air or down toward the ground give away that your motion will not lead to a release. Keep your arm on a relatively flat, forward trajectory so a mark believes it could lead to a real throw. Finally, once you’ve swung our arm through to a natural release point, a healthy amount of wrist snap will help make your fake believable. Many newer players have a tendency to fake by simply moving their arm to where their release point is and then stopping, neglecting the wrist snap that is crucial to actually making the disc go anywhere. Add a sharp wrist snap to the end of your fake to mimic a full, realistic throwing motion. One of the trickier parts of faking effectively is making sure you keep your balance while pivoting. If you step out for a beautiful, believable backhand fake that puts your mark out of position but then struggle to regain your balance when pivoting back to the forehand side, you’ve lost the advantage you gained with your fake. Before working fakes with big pivot steps into game situations, practice extending to the full range of your pivot step and maintaining your balance. This is most commonly an issue when pivoting out to fake a backhand and returning to throw a forehand simply because the pivot step for a backhand is much longer. To keep your balance, engage your core and keep your back upright. Stay in control of your body and don’t lean! Additionally, make sure you keep your knee over your ankle when stepping out to avoid knee injuries. Feel the glute and quad of your stepping leg engage to keep everything in line and in control. With those faking form building blocks in place, it’s time to practice them against an active mark. Drills like 3-person marking or a simple breakmark drill are a great place to challenge yourself and expand your faking repertoire. These drills usually offer the thrower only one target, which they must try to hit around a very active mark. Rule #1: fake like you throw. Don’t develop a special “faking” motion that differs from an actual throw. Make it the same to make it believable. Don’t fake the same throw you intend to throw (or, don’t throw where you just faked to). Create space by faking to a different spot and forcing your mark to move. Fake a variety of angles and release points. If you continually fake the exact same release point, your mark won’t have to adjust much to take away the throws you’re looking for. Vary the speed and timing of your fakes. Faking like a pendulum, with a predictable back-and-forth motion, is a surefire way to get hand blocked. If the number one rule of faking is fake like you throw, the number two rule is fake for a reason. Faking wildly and constantly does nothing but tire you out, and might even cause you to miss open options that develop downfield. It’s absolutely fine to hold on to the disc without faking for a few stall counts – survey the field, identify what options are developing, and set up your fakes intentionally when you know what you want to throw to. Elite players typically fake for one of two reasons: to put the defense out of position or to communicate with their teammates on offense. You receive a swing pass on the break side in the middle of the field. Look further to the break side and fake to continue the swing, getting your mark to overcommit to taking away the swing, opening up a downfield lane. Bonus: if you look to the break side and the swing is open, you’re prepared to throw it! You make a strike cut and get open with lots of momentum towards your scoring endzone. 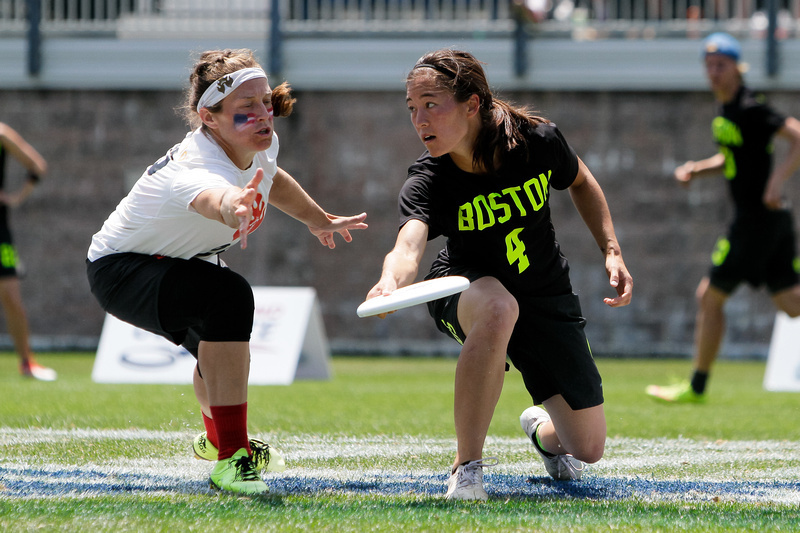 Translate that momentum into a big huck fake -- your trailing mark might over-pursue to the open side in an attempt to stop the huck, giving you lots of space to swing the disc back to the break side. You’re trapped on the sideline and a handler is setting up a swing cut for you on the break side. Right before you want to pivot to throw around to the swing, fake to the inside lane. Faking upfield won’t get a reaction from a good mark; they’re much more likely to jump to stop an inside throw to the break side, giving you more space around. In a zone, you think you see a hole through two players in the cup to your cutter behind them. Throw a quick fake towards that hole to see if the cup collapses to take it away; if the hole remains, the throw is probably safe. Expert zone defenders are great at making space seem more open than it is, so reveal what space they’re ready to attack with fakes. You’re playing against a team that’s known for its poachy defense. Similar to a zone, if a cutter downfield looks deceptively open, throw a quick fake to see if a poaching player jumps into that throwing lane. If the defender is poaching off a handler, this jump might open up an easy swing that can turn into some unstoppable give-go action, too. Fakes are also an incredibly effective way to communicate with the rest of your team on offense. In general, a hard fake towards a your own teammate communicates that you are not prepared to throw to their current cut and they need to change direction. Within this general framework, there are lots of different ways to communicate something more specific with a well-placed fake -- just make sure your whole team is on the same page. A cutter is taking off deep, but they’re either not open enough or too far outside of your throwing range for a huck to be viable. Pump-fake to tell them to come under. A cutter is making an under cut, but their defense is too close and you don’t feel safe throwing to that matchup. Throw a fake to tell them to clear out of the open side lane. If they change direction toward the break side, this can even open up an opportunity to hit throw to them in that inside throwing lane. A handler is set up to get open for a reset from you, but waits for your signal to cut. Turn towards the handler and fake to indicate you need them to cut for you. A good fake is one of the most powerful tools you have as a thrower to dictate what happens on the field around you. Take the time to conscientiously practice your faking form, fundamentals, and scenarios so they become a weapon to make you a more confident, dangerous thrower. Just think of that off hand as a training wheel; it’ll help you learn correct form and succeed in the short-term but, when you’re ready, you should challenge yourself to perform without it. No no no no. The offhand is critical to stabilizing the disc in a good backhand form. It is critical to switching grips quickly and comfortably. It is not a training wheel. It is the proper form. To keep your balance, engage your core and keep your back upright. Stay in control of your body and don’t lean! Yes yes yes yes. Bending your pivot knee will help you keep your back upright—and therefore your center of mass balanced evenly between both legs—on a backhand throw (or fake). This is a great article on a very important topic that is often overlooked. There are two main points that I take issue with - the first was already pointed out by @arieljackson. I think the vast majority of elite throwers use their off-hand to stabilize the disc on both flicks and backhands. In my opinion, there should be a third scenario in here, which is holstering a throw that the defense stops. For example, if I have the disc and am being forced flick, my first breakside look is usually an inside flick. However, if I start to step out or wind up for that throw and feel the defense bite on it, that is when I’ll fake the throw (holster a throw I’d normally take) and pivot around for the backhand. Granted this is a lengthy discussion. I wonder if some GIFs or clips would be useful, showing a Brett Matzuka fake arsenal, Alan Kolick fakes along with younger thrower with good mechanics in college (Trent Dillons, Shoham Shah, Mark Vandenberg). Unless rise-up ultimate already had a “fake” session uploaded. Agreed, I’d love to see some gifs here.